A new University of Colorado Boulder framework used to screen hundreds of organic chemical compounds used in hydraulic fracturing, or fracking, shows that 15 may be of concern as groundwater contaminants based on their toxicity, mobility, persistence and frequency of use. Using a fast groundwater transport scenario, the team predicted that 41 of the 659 organic compounds screened would have 10 percent or more of their initial concentrations remaining at a transport distance of roughly 300 feet. That is the average state "setback" distance in the United States between a fracking well and a drinking water well, said CU-Boulder Professor Joseph Ryan, the principal investigator on the study. In the fracking process, a mixture of water, sand and various chemicals is pumped into wells at high pressure to create fissures in subterranean shale layers to release natural gas and oil. Oil and gas companies use a wide variety of chemicals to increase viscosity, inhibit equipment corrosion and reduce friction, among other things. The 659 compounds screened by the CU-Boulder team were gleaned in large part from the nationwide FracFocus Chemical Disclosure Registry used by many states in which companies disclose chemical information about most of the ingredients used in the fracking process at individual wells. The CU-Boulder team obtained data from more than 50,000 wells in Colorado, North Dakota, Pennsylvania and Texas since 2011, said Ryan, a faculty member in the Department of Civil, Environmental and Architectural Engineering. "We wanted to evaluate which compounds we should be paying attention to based not just on toxicity but also on the extent a particular compound travels from one place to another through groundwater," said Ryan. "We found 41 compounds that were considered mobile and persistent, and a handful of those we would not want in our drinking water." Corresponding study author Jessica Rogers, a CU-Boulder doctoral student in civil, environmental and architectural engineering, said the remaining 26 compounds predicted to be mobile and persistent were very rare and were identified in fewer than 50 of the 50,000 FracFocus reports analyzed for the CU-Boulder study. Ryan said the new study may reduce the alarm associated with statements that imply that hundreds of chemical compounds used in hydraulic fracturing fluid are at risk of contaminating groundwater. "But it also demonstrates a subset of these compounds could result in potentially hazardous exposures following spills or well failures." A paper on the subject was published online in Environmental Science & Technology Letters published by the American Chemical Society. Co-authors included CU-Boulder researcher Troy Burke and Cal Poly Pomona Associate Professor Stephen Osborn. The work was funded by the National Science Foundation and a U.S. Environmental Protection Agency STAR fellowship to Rogers, first author on the paper. "There were two main objectives with this project," said Rogers. "The first was to develop a screening process that could be used by researchers or others to prioritize organic fracking compounds based on how mobile and persistent they are in groundwater. The second was to use the framework to perform an initial screening based on currently available knowledge on the compounds identified in fracturing fluid by FracFocus." The screening process included using known degradation rates of particular organic compounds horizontally transported from a point of release, like a failed well casing, to a drinking water well, said Ryan. The researchers took into consideration the chemical structure and stability of each organic compound and its behavior in water. They also used a wastewater treatment process simulator called BIOWIN 4 to help estimate the biodegradation of the organic compounds over time. Of the 15 compounds that were found to be of concern as groundwater contaminants in the CU-Boulder assessment, only two of those - naphthalene and 2-butyoxyethanol - were identified on more than 20 percent of the 50,000 FracFocus reports. Only four of the compounds were identified on more than 5 percent of the reports. 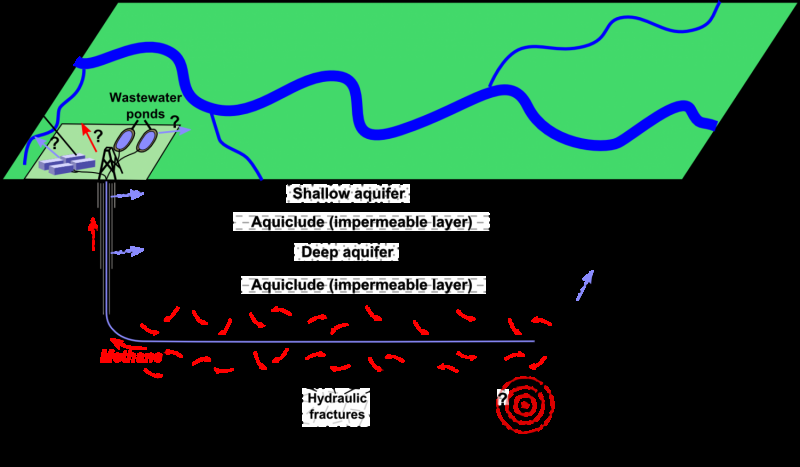 The two transport scenarios considered were a highly porous aquifer with relatively fast groundwater velocity and a less porous aquifer with slower velocity. Compounds were evaluated for potential toxicity using the National Primary Drinking Water Regulations and Health Assessment Information, said Ryan. "Just because a compound has been put into the ground doesn't mean it is going to migrate to a place where humans will be exposed to it," said Ryan. "On the other hand, problems with particular compounds in groundwater could take a decade or so to even show up. We don't know enough about some of these processes right now." One persistent complaint by environmental groups is that information posted by the FracFocus registry has only been on a well-by-well basis and only in a PDF format, making it extremely difficult to assemble large and meaningful data sets, said Ryan. "We found out that pulling out data we needed, like how frequently a particular compound was used in hydraulic fracturing in wells across the country, was not so easy to do," Ryan said. "But to evaluate mobility and persistence, we used existing tools so that others follow the same approach for looking at other organic compounds of interest." The next stage of the CU-Boulder research effort could involve looking at chemical products produced by the breakdown of fracking fluids or considering the return of known fracking compounds to the surface, said Rogers. "Currently we don't have enough information on these processes to account for them consistently in our screening framework, but the science is rapidly evolving." Wastewater contains a lot of bacteria and nutrients. Pumping this wastewater underground where anoxic (anaerobic) conditions prevail may be beneficial or dangerous. Wastewater in a Limestone containing reservoir and at anaerobic condition may produced methane gas. However, if sulfate containing stones are present in the reservoir , then the bacteria will definitely produce highly toxic hydrogen sulfide. I mean the temperature deep down where wastewater is pumped and plus the presence of nutrient and anaerobic condition, it is a heaven for anaerobic bacteria to grow.. It all depend on what is the composition of the oil reservoir.Let us hope that dolomite and limestone are in the oil reservoir. Then No toxic hydrogen sulfide will be produced, but methane gas may be produced. I think this worth a study. covering wastewater to methane. I meant converting wastewater into methane gas is the outcome when wastewater i s pumped down in deep oil wells. This is because wastewater contains huge amount of bacteria and nutrient. Deep inside the oil reservoir anaerobic (anoxic) conditions prevail. In the present of limestone or dolomite methane gas may be produced. One old theory believe that the disappearance or extinction of the dinosaur few millions years ago could well be explained by the toxic effect of hydrogen sulfide. It all started with an earth quick below huge lake that contains dirty water ( full of nutrient and bacteria). This water went into a reservoir composed of Gypsum. Hydrogen sulfide gas start evolving and the pressure of this gas increase with time. This is what killed the dinosaurs. Why are we letting Big Money contaminate our water?